When you are staying in Portugal for holidays or even living here for the warm nine months of the year it is almost impossible to contemplate how to make your Portuguese home warm in winter. All it will take is a week spent in a drafty, un-insulated apartment of house for you consider quitting Portugal for good. I have met many people who complain that the coldest they have ever been in their lives is during a winter in Portugal. No its not but what the main cause of complaints is about feeling cold is the massive difference in day to night temperature. As an example 22 C degrees during your outdoor lunch to 2 or 3 C degrees at night and the cool down is very rapid indeed. It is felt with more impact because out bodies and clothing choices take longer to adapt. Most people react rapidly to the problem by rushing off the following day to buy electric or portable gas heaters. These are not good solutions and are expensive to run. I have written a few blog posts over the years about heating your home with wood burning stoves. But where should you start to make your home during the winter. Firstly you will have to accept that even if your home is fairly new you are unlikely to have any insulation in the walls or roof. Even if you do it is unlikely to be installed to a standard that you would expect in northern Europe. Windows and doors will not be sealed as well as you would expect at home. Most people keep their gas boilers until they fall apart. They will never have been serviced. The flue may be dangerous and the gas supply will no doubt need to be replaced to meet modern standards of safty. The boilers usually only heat the water too. So this is an ideal place to start. TIP- Budget to replace the gas supply from bottles to boiler. While you’re at it make the gas bottle connections suitable for 2 or even 4 large bottles of gas if you are over wintering in Portugal. You will need to build a small “gas house” to house the bottles and keep them safe out of the sun/frost. Now choose a boiler that will heat both hot water with an internal tank big enough to satisfy a long shower and also heat the radiators. What is a big enough boiler? 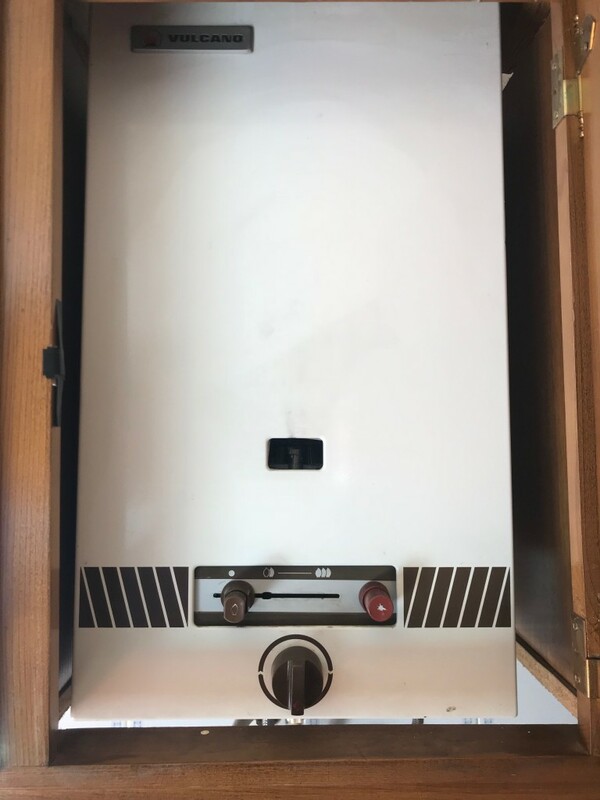 It’s no good asking a local gas boiler vendor as they are usually responsible for some of the awful and often dangerous installations that we come across. There is a way that you size your boiler and radiator requirements yourself or you can just ask Castelo Construction we will be happy to help. Also because your house in Portugal wont be well insulated I would advise upping the number of BTU’s that you calculate by 20% to make sure you will stay warm in the event of a cold snap.